Classes times 4:00pm to 4:25pm. Little Dragons focuses on improving Pre-School children’s listening and building confidence, self esteem, concentration, discipline while improving co-ordination skills. 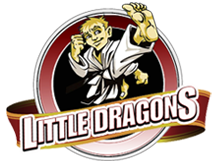 Give your child the best possible start in life: The Little Dragon’s program is specifically designed for 4 to 6 year olds, with the emphasis on having fun, learning life skills and self-defense through Martial Arts. Please bring your child for a free class, you will be allowed to sit next to the mat and watch your child having fun while learning.